Lincoln's Legacy: A Conversation with Henry Louis Gates, Jr.
Wed. February 11th, 9 p.m. on THIRTEEN and THIRTEEN HD. Thu. February 12th, 9 p.m. on WLIW21. THIRTEEN commemorates the Abraham Lincoln Bicentennial with Looking for Lincoln, a landmark two-hour special dedicated to the life, legend and legacy of our nation’s 16th president. The program, which airs on the eve of Lincoln’s 200th birthday and features a comprehensive, content-rich Web site, reflects THIRTEEN’s ongoing commitment to producing groundbreaking public television programming and web content. Presented and written by acclaimed Harvard University professor Henry Louis Gates, Jr. with commentary by Doris Kearns Goodwin, LOOKING FOR LINCOLN explores the controversies, paradoxes and contradictions surrounding our nation’s 16th president. Gates embarks on an ambitious, cross-country quest to understand Lincoln, which takes this accomplished scholar from Illinois to Gettysburg and Washington, D.C. Along the way, leading historians, former presidents and Pulitzer Prize-winning authors weigh in on Lincoln’s influence on our nation’s history. What made Lincoln such a unique president? Why is Lincoln’s legacy so contested? Because Lincoln is so closely identified with what it is to be American, everyone wants to claim him, to rewrite his story to satisfy their own particular needs. For my own people, it was important to imagine him as the Great Emancipator, the Moses who led us out of slavery. For others, it was Lincoln the humble man who rose to greatness, or Lincoln the great Commander, or Lincoln the martyr. Every generation since his death has conjured up their own Lincoln. There were many Lincolns — enough for people to love and hate. Growing up in West Virginia, what was your early impression of President Lincoln? Lincoln was the only white man’s photo hanging in people’s homes where I grew up, other than Jesus. We knew him as a great emancipator. He was the man! What surprised you most about Lincoln as a person and as a president? This project has been a tremendous learning experience for me. I had to really wrestle the fact that the Great Emancipator had a much more complicated relationship with race than I ever dreamed. He had strong white supremacists views, and favored the expatriation of freed slaves to colonies in Africa or Panama, even as he was writing the Emancipation Proclamation. This was deeply disappointing to me, but also led me to perhaps a deeper appreciation of the human foibles of the man. What do you think Lincoln would think about Barack Obama — an African-American man — assuming the presidency? He would be shocked. After he got over the shock, I think he would find it ironic that his most direct heir was a black man — and a mulatto. Lincoln would love the fact that Obama is such a great conciliator, trying to transcend ideology. People don’t realize what a brilliant politician Lincoln was. Looking back, we want to ascribe a level of providence to his every decision but he was a cunning and calculating politician; from the cultivation of his image as a hayseed from Illinois, to his ability to keep this country together under dire circumstances. Obama, I think, shares much of Lincoln’s political intelligence. I think Lincoln would admire that. What served as a turning point for Lincoln, in terms of his understanding of race? Getting to know Frederick Douglass really helped him to appreciate the potential for black people. Lincoln really didn’t know any black people, other than his barber. Frederick Douglass really impressed him with his intelligence and his insight. Perhaps even more important was Lincoln’s desperation over the war. It was in his search for a way out of the darkness – both of personal loss and military defeat – that he saw the moral and practical necessity of emancipation. How did Lincoln become such a mythic figure in American history? Keeping the Union together, freeing slaves and being assassinated all added up to creating “Lincoln the myth.” He overcame a lot of his own prejudices and became what many would consider the first black man’s president. What impact did Lincoln’s assassination have on the nation? His tragic death had an enormous impact on the American psyche. When Lincoln died, people were calling him the “American Christ” — his sacrifice analogized to Jesus’ crucifixion washing away the sins of a guilty nation — and to Moses dying on the verge of the Promised Land. It was a very religious society and these comparisons came freely. It was doubly ironic because, of course, he had been so widely detested during his Presidency. What do you hope Thirteen viewers will learn about our nation’s 16th president from watching Looking for Lincoln? That he was a great man because he wrestled honestly with his own fears, prejudices and limitations. He overcame them, by and large. And that’s the best any of us can hope for. Lincoln was a three-dimensional, flesh-and-blood human being — and therein lies his appeal. The more human he was, the taller he stands in American history. 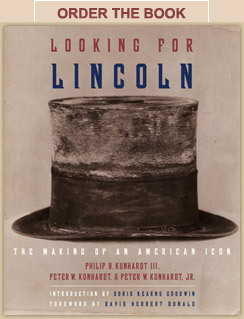 Sole corporate funding for Looking for Lincoln is provided by State Farm®. Major funding is provided by CPB and PBS. Additional funding for education outreach is provided by the Motorola Foundation.